Anderson Cemetery: Hoax or Legend? 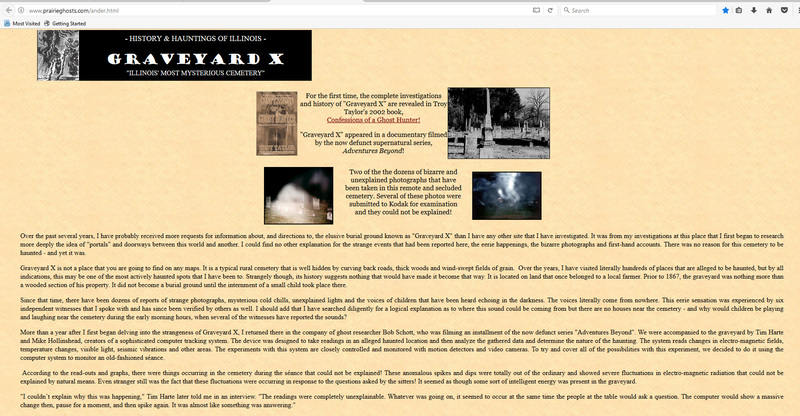 Is rural Illinois’ infamous “Graveyard X” simply a publicity stunt that got out of hand, or is it a portal to the beyond? “Graveyard X.” The name conjures up images of a foreboding and desolate graveyard―a secretive place known only to an elite cabal of investigators who made an arrangement with local authorities to keep its location a secret. Only a privileged few have access to “the most haunted cemetery in Illinois.” A silly but romantic story. Located south of Taylorville, Illinois near the tiny town of Clarksdale, “Graveyard X,” or “Cemetery X” as sometimes known, is actually Thomas Anderson Cemetery. Though hyped as Central Illinois’ version of Bachelor’s Grove (a cemetery in southwest suburban Chicago internationally-known for its ghostly legends) in the late ’90s and early 2000s, Thomas Anderson Cemetery is really an unremarkable rural cemetery. It’s not even abandoned. Half-hearted attempts to keep its identity a secret have not been successful. In Troy Taylor’s book Beyond the Grave (2001), Anderson Cemetery, buoyed by a background story lifted from the pages of a Christian County cemetery record, was featured in a section entitled “Mysteries of the Grave.” That same year, the Field Guide to Illinois Hauntings, published by Taylor’s press, Whitechapel Productions, included an entry for “Graveyard X” with the very same background story. “Graveyard X is not a place you are going to find on any maps. It is a typical rural cemetery that is well hidden by curving back roads…” Aside from the name, they are identical. Even the web page for “Graveyard X” has the first five letters of “Anderson” in its address. You can see the Boyd obelisk monument, which a vandal later stupidly knocked over, in a black and white picture on the page. This cemetery’s claim to fame seems to be its inclusion in a documentary called America’s Most Haunted, which Troy Taylor highly dramatized in Beyond the Grave as well as Confessions of a Ghost Hunter. Dozens of amateur pictures of mists and orbs taken here have circulated the Internet as well. There are no true legends or stories associated with the cemetery, only vague accounts of “cold spots” and other phenomenon. Later, Larry Wilson wrote about “Graveyard X” in his book Chasing Shadows (2011). It turns out there are actually two Anderson Cemeteries in Christian County. Wilson doesn’t say which Anderson Cemetery he visited, but he described other accounts of encounters with glowing balls of light and batteries that quickly drain. Was “Graveyard X” simply a publicity stunt that got out of hand, or is it as Troy Taylor maintains, a portal to the beyond? Somewhere near the cemetery was another interesting location, known as “Rober’s Court [sic].” It was a graffiti-covered boulder and a stone cabin located near a small bridge. Troy Taylor made brief mention of it in Beyond the Grave, but I’m unfamiliar with its history. Sometime in the mid-2000s, it was moved to another location. Troy Taylor, Beyond the Grave (Alton: Whitechapel Productions Press, 2001). Troy Taylor, Confessions of a Ghost Hunter (Alton: Whitechapel Productions Press, 2002). Larry Wilson, Chasing Shadows: Investigating the Paranormal in Illinois, Missouri, and Iowa (Rockford: Black Oak Media, 2011).